The theme was cute, and pretty easy once it became clear. We add ELS to the end of common phrases. I was expecting a CTA revealer and didn’t get one. 19a [Dromedaries on patrol?] are SECURITY CAMELS (security cam). They can spit at intruders. 36a [Henhouses of ill repute?] are CHICKEN BROTHELS (chicken broth). Just, no. 49a [The “I” and “o” of “I do”?] are MARRIAGE VOWELS (wedding vow). Three theme answers, all solidly in the language. Consistent. Nice Wednesday theme. Since there are only three theme answers, we have room for some interesting fill. I particularly liked two of the longer Downs, which were symmetrical: FAT CHANCE and OH COME ON. 3d [Escape tool secreted in a cake, in cartoons] is a FILE, probably made by ACME. 26d [Like a basted turkey] is MOIST. Pro tip: no need to baste a turkey. For an unstuffed turkey, bake at 350 for 45 minutes + 7 minutes per pound. Works every time and it’s perfect. 30d [Pack-toting equines] are ASSES; I was thinking of llamas, but they’re camelids, not equines. I filled in ALBEE and EMAJ from crosses and for a confused minute couldn’t figure out what words they were. [“The Zoo Story playwright Edward] and [Key with four sharps: Abbr.] respectively. Do EMIRS always wear robes? Are all guerrilla fighters INSURGENTs? What I didn’t know before I did this puzzle: I’m blank. There’s probably something, but I’m in my fourth hotel room in six nights and my brain is mush. I like a good before-and-after theme in which two two-word phrases share a common word. There are generally good opportunities for humor, and if the theme is tight and consistent, it gets high marks from me. This one ticks all the boxes. In this case, the tightness of the theme comes from the first word in each phrase being a part of the head, hence the title. 17a [Job in the cosmetics plant?] EYESHADOW BOXING. Sounds reasonable. 21a [Florist’s reaction to a job well done?] NOSEGAY PRIDE. Ha! 50a [Site of disgusting swab exhibits?] EARWAX MUSEUM. On what planet is this not funny. No planet, I say! That being said, there are actually people who upload videos of ear wax removal onto Youtube. Don’t go there. 58a [Benefactor to a harmonica band?] MOUTH ORGAN DONOR. Works for me! 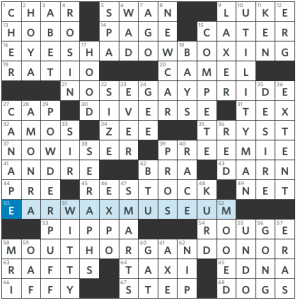 Fun theme (until I started finding earwax videos). And like I said: Tight, consistent, and humorous. A nice win in my book. Our long Downs are POWDER PUFF (nice) and UTILITY MAN, a phrase I was unaware of [Versatile baseball player]. Not a lot of other interesting fill, though. SERAPHS is nice, and so is PREEMIE, though it’s followed shortly thereafter by PRE which seems like a dupe. I also like CANAPE and AMON-RA, though I went with AMEN-RA to begin with. With nothing really to gripe about in the grid, let’s move on to clues, of which there were three that caught my attention. 64a [Hail target]. I went with MARY at first. The correct answer is TAXI. 68a [A few pointers, say]. DOGS. Nice misdirection. 22d [Fitting number]. I was thinking music or SONG at first, but it’s SIZE. Here’s CHER in her Oscar-winning turn as Loretta Castorini in Moonstruck. 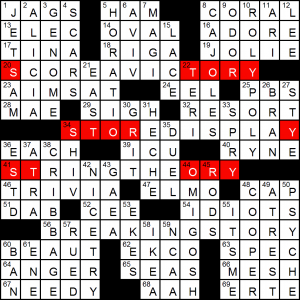 BREAKINGSTORY is the revealer, and 3 answers conceal STORY at their edges, broken in different ways: SCOREAVICTORY, STOREDISPLAY and STRINGTHEORY. Five letters is a lot to work with, and that possibly explains the more mundane theme answers. In the rest of the grid, there weren’t that many phrase answers, but there still a number of grace notes. Highlights included: JETSAM, CAJOLES, ROLYPOLY, CRIBBAGE, NICETRY and PSYCHE. 3.5 Stars, and a TRIVIA shoutout to all the llamas starting the season today! It’s a double dose of themeless fun from the AVCX this week, featuring two puzzles they handed out at the Lollapuzzoola tournament last weekend. I totally recommend getting in on that puzzle set while it’s still available – it was pretty dang fantastic, and I don’t just say that because I ended up placing 11th in my division, my best finish ever at Lolla. It’s good stuff. In the spirit of Lolla, I used these puzzles as warmups and as a way to pass time on the bus ride back to Boston, so no solve times this week. My handouts from Lolla have different numbering to today’s .PUZ files as to which themeless is number one and which is number two, so I’m going to split them up by their authors. First up, the puzzle by Josh Knapp. Okay, onto the next puzzle. This one’s from Andy Kravis (of Cruciverbalist at Law and Grid Wars), ft. Neville Fogarty (who I assume did the guest rap verse that comes in the middle of the puzzle after the chorus if pop music has taught me anything). This one’s also a lovely grid, reminiscent of the fourth grid wars challenge, with a nice stair-step pattern in the middle. The fill there’s nice, with DO SOMETHING, CENTRAL TIME, and WORD LADDERS locking nicely together. In the rest of the grid, I’m fond of WOMBATS, OCTANES, DHAKA, MAIS OUI, TWO FACE, Woodchuck PEAR CIDER, YOU MADE IT, TEST LAB, and I’M STUFFED. This grid is pretty stuffed, and made for a great bus ride solve while somewhere in CT.
Two solid AVCX themelesses in one week is a pretty great treat. Hope you thought the same. This entry was posted in Daily Puzzles and tagged Andy Kravis, C.C. Burnikel, Dan Fisher, Joe Kidd, Josh Knapp, Mike Shenk, Neville Fogarty. Bookmark the permalink. NYT: Could the “revealer” be those L-shaped blocks? I’m still going to baste my bird with beer. Do you know about the beer can technique? I just now looked this up. It looks intriguing but would need a fairly large amount of headroom in the grill. We may try it this year. Seems a bit odd to have just 3 theme entries and no revealer. After the first entry, I was guessing that “RA” was being changed to “L”. I had the same thought. Lise could be right about the grid. If so, I’d expect all the black squares in the L shape, not just two. (I think I’ve seen a puzzle with T’s done that way, not sure about L’s though.) 14-letter theme entries lend themselves to that black square treatment to help with the fill in the corners. I thought I’d found another feature — the EL in the themers crosses with EL in the down answer. But that’s only the case with the first two. The clue for SEED made me chuckle. “I’d like a seed, please,” said the gardener at the garden store. Seed is often used as a plural. Though I do think farmer, not gardener when I see a feed and seed store. And a nice puzzle, I thought. WSJ: re EARWAX MUSEUM: a not-unheard of name for a record store, though more often as three words. Not sure exactly of the two AV Club is being rated, but thought they were both excellent. Kravis was much harder for me than Knapp, but more satisfying to solve in a way. I loved them both too. 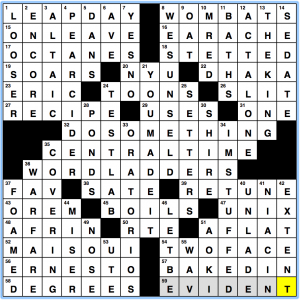 I thought the opposite about the relative difficulties – I demolished the Andy Kravis (except for wanting to write WABBITS for 8A, which slowed me down a little) but with the Josh Knapp, was stuck in the SW for nearly forever. Who would have thought there would be two baseball teams with the same number of letters in their nicknames which both had a mascot that started with “Mr”? Evidently not me. Also I wasn’t paying attention when I wrote the answer to 62A (had some of the letters already, which sometimes throws me) and I couldn’t imagine why Steven Tyler would name his daughter “Yiv” but I finally got it straight. Could someone please make a puzzle with WABBITS? or at least WABBIT? Are we sure Merl did not do that already? It definitely feels like a puin he could have “wun” into the ground. NYT was a very weak puzzle. Let’s. It try to pretend it wasn’t. Rex is really curmudgeonly these days, and that’s why I first visited this site, but let’s not swing so far to the other side. The fill was really stale. You liked OH COME ON, and I would have, too, except the actual answer was the outdated and effete OH COME NOW. See how your brain changed that in order to improve the puzzle? Understandable mistake. Yesterday’s NYT was nearly as dull and pointless as this one. I hope next week’s Tuesday and Wednesday puzzles are better. 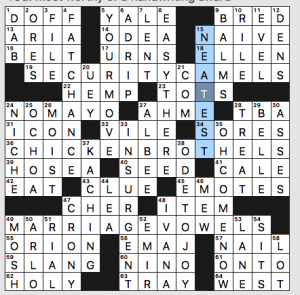 Maybe Shortz is putting too much time into his cast and lucrative crossword book empire. 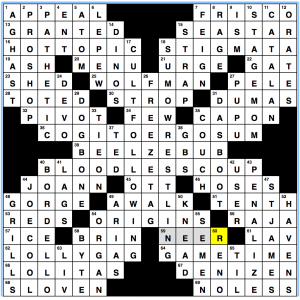 I loved the puzzle – apart from the reasonably solid theme answers, how can you not like all those long down answers? Fresh and fun to solve. Many thanks for the link to “Moonstruck” clips! I had a lovely time watching many of them!